Within LiveEngage lies the capability to generate an SMS clickable mobile content campaign. This content can be generated by a targeted mobile campaign. 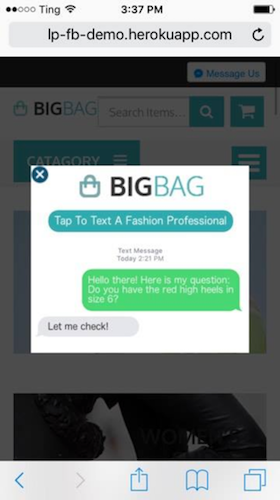 Visitors on a brand’s website can now click the content and begin an SMS conversation with the brand. Log into your LiveEngage account. Create a new campaign specifically for SMS content engagements and set a meaningful name. Under Target Audience, change the target Platform to Mobile Smartphone - the SMS link will not function on desktop. c. Format: Overlay or an embedded format, but it must be an HTML Engagement. This is important for setting the SMS link. Move to the next step: Engagement studio. Use the following code template for your engagement. The capitalized portions should be replaced. SMS_NUMBER_WITH_COUNTRY_CODE The LiveEngage enabled SMS number. Be sure to include the country code. CALL_TO_ACTION Can be an image, text, any HTML that is the visual representation of the engagement. See example below which uses an overlay image. In order to ensure that responses from a brand are received by the consumer in the same thread, the brand needs to ensure that the initial text be sent to a full format number e.g. +1(000) 000-0000. Numbers cannot be in toll free number format, otherwise the thread will break. A "Time on Entry Point" behavior may utilize the new entry points you've just created. Otherwise "All Behaviors" will be fine. Save and publish your engagements. They will not display until you've added the necessary Entry Point Section attribute on your website. 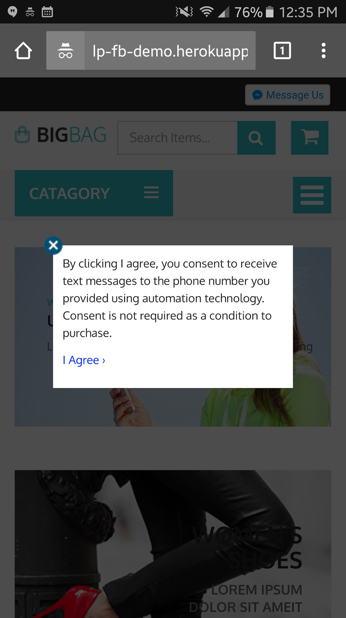 It is possible to also include an opt in message prior to opening the SMS application, which makes sure the consumer agrees to receiving texts through the LivePerson system. The goal is to add an additional view within the LiveEngage content engagement, which will contain the disclaimer and the actual SMS link to the conversation. Go to the SMS content engagements campaign and click "Add Engagement". Click HTML Engagement and click next to get to the Engagement Studio. In the Engagement Studio use the HTML engagement content example below and paste into the HTML code box with the correct information in the highlighted areas. See the below example of the HTML engagement content. This option is for providing the invitation outside of LiveEngage (example size set to size 250 x 200px). You will need to add code which unhides the outermost div sms-modal when you want the modal to appear. You will also need to use the browser detection code listed earlier to determine the format of the SMS link.